Paul Rodgers singing Led Zeppelin (Rock and Roll)! My dream has come true! 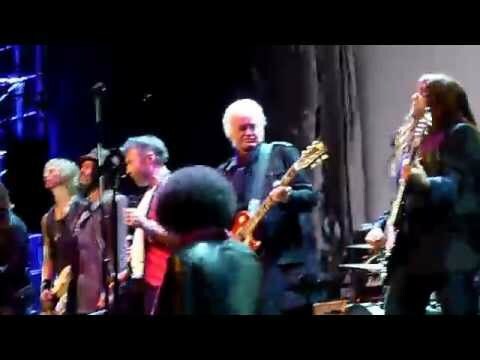 At a recent event honoring Jimmy Page Paul Rodgers got up there and sang Rock and Roll along with another vocalist who I can't identify. In the beginning Paul's sound levels are down but in the link below you can see him singing it. SKIP TO 8:45 in the video for some kickass singing from Paul. And he sings it even better than Robert! He should really consider doing an album of Led Zep covers. I would be the first to buy it (if Ken doesn't beat me first). WOW! Even as a Plant fan I could say Rodgers voice definitely aged better. He only seems to have gotten more power over the years. Jimmy needs to give Paul a call pronto on another "Firm" esque supergroup and give Robert Plant a break. Yeah it's crazy how good he is. I remember watching the video the first time and heard Paul singing it in the lower interval that Robert fell back on and thought to myself, "Okay I know he's capable of more than this." Then I watched the whole video through and was blown away when I heard him belting out the original melody at the end. Shows what a great singer he is. Paul loves to save his best and highest singing for the end of many songs.